Knowing ways to feel grounded is an essential skill that we all need to have at some point or other in our lives. Some of us need it more than others, some of us struggle with it more than others. In this fast paced world we are often a bit all-over-the-place. Maybe feeling easily distracted, flighty, anxious, stressed, a bit wobbly, feeling, emotional, tearful and lot more. All of these mean we could benefit from knowing how to feel grounded. That’s OK if you feel like that. The trick is to recognise when you need to feel grounded and, more importantly, what you can do about it. So what exactly is “being grounded” all about? It’s a bit more grown up than your parents saying you have to stay in for a week for misbehaving!! It’s about being totally connected with yourself, connected with ground, with earth. Now I’m not going all tree-huggy on you – honestly! It’s being aware of yourself, of your mind and body and feeling balanced or calm or steady, regardless of what’s happening with your or your circumstances. I know I said I’m not being tree-huggy, but think of a tree. It’s strong and steady, can move in the breeze but stay firmly rooted and (usually) withstand anything that comes along. It would be good if you can feel like that too – right? There are some really quick and easy ways to feel grounded that you can incorporate into your everyday life. There are also others that mean taking a bit of time but can also be incredibly good too. Overall, it’s about using all of your senses to being in touch with or connect to things around you. That way you can reconnect to present time, present place, present circumstances. Chocolate, had to be in there somewhere didn’t it! I know people often use chocolate and that’s fine, just don’t overload on it. Citrus enhances your taste buds, so have a lemon drink or an orange as it stimulates your brain. Coffee, that saying “wake up and smell the coffee” is there for a reason! Counting, any counting is good, but backwards from 100, minus 7 is kinda challenging and so focusses the mind on that, rather than everything else! Gardening, very sensory with touch, smell, colours, textures, even exercise of digging or weeding allowing the mind to just flow. Have a massage. OK it takes a bit more planning usually but is still great. Moisturise, rub moisturiser into your hands using deep pressure and slow rub of hands is quick and effective. This is more stress reducing and grounding that you might realise! Self Hypnosis, or meditation where you stop and think about each part of your body, work from head to toe or vice versa. Singing encourages deep breathing and calms or invigorates you. It doesn’t have to public! Visualise yourself being connected with earth, being strong and steady or being the way you wish to be. Write a journal or diary. Getting things out of your head and on paper is great. Yoga is great for breathing, focus, body awareness. So that’s my tips. Are there any in there that you already do or even ones that you think you could do easily? I’d love to know what you do and if you can add any more that help you. Let me know in the comments space below or drop me an email or pop over to share on my Facebook Page. 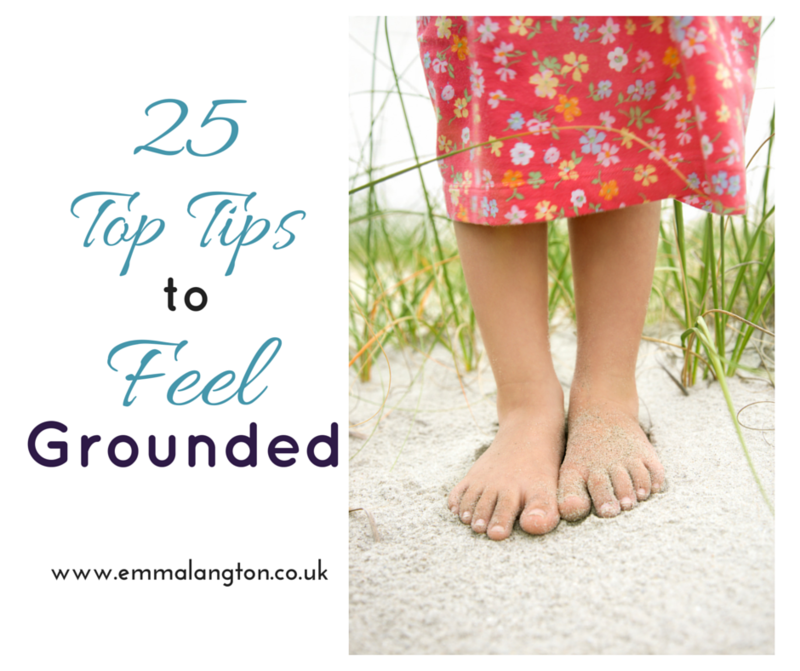 Thanks for these tips Emma, I only recently discovered the importance and benefits of feeling grounded. These really help and I feel so much better. Hi Diane, You’re very welcome. So glad you’ve discovered how they can help. I hope you can incorporate them easily in your life now. Great that you feel so much better. Watch our for my next blog about visualising and how that can help improve your life too! Ooh I love getting a massage good for all sorts of reasons and now I know it’s good for grounding too! Having a jacuzzi really works for me to clear my mind and bring myself back to myself. If I can’t get a jacuzzi or a walk on the beach then I’ll have a shower, there’s definitely something about being connected to water that’s grounding for me. Water is incredibly sensory and taps into our very early life – it’s all water in the womb. Doesn’t work for everyone, but great that you know what works for you!